Do you have a burden for friends or neighbors who need the hope of Jesus Christ? Are you looking for an opportunity to share your faith with them in a clear, non-threatening way? 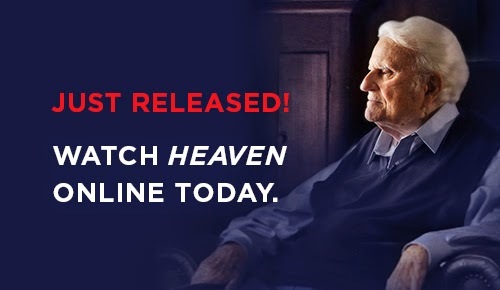 Watch Billy Graham’s powerful new program, Heaven, online now. This 30-minute film combines riveting testimonies with a straightforward Gospel message. You’ll see the powerful true stories of two people who came face to face with death—and hear from Billy Graham about what happens when this life is over. Pray for your friends and then invite them to see it with you. Perhaps God will use it to change their lives forever.